Monash University Museum of Art | MUMA in partnership with Monash Art Design & Architecture (MADA) present Walking on Bones, Empowering Memory: Brook Andrew and guests; a special panel discussion with experts on memorialisation of genocide, displacement and massacre from around the world. In Australia, we walk on bones. There is a history of massacres and battles that is rarely memorialised in the public sphere. The Frontier Wars shaped the emergence of the modern Australian nation, yet its memories are often carried as deeply personal stories of loss and sites of trauma remain unmarked or contested. In the current upswell of activity towards addressing traumatic histories in Australia, and also across the world, the Wiradjuri artist Brook Andrew is asking what can be learned from international developments and grassroots actions. How can consensus on a place of healing for these histories and memories be formed? What is the role of art and architecture? What can a memorial account for? These questions are driving Brook Andrew’s Australian Research Council (ARC)-funded project ‘Representation, Remembrance and the Memorial’. Ms. Savina Sirik, Team Leader Transitional Justice Program, Documentation Center of Cambodia, Phnom Penh, Cambodia; current PhD candidate, Peace and Development Research, School of Global Studies, the University of Gothenburg, Sweden. Professor Marcia Langton AM, descendant of the Yiman people of Queensland, Foundation Chair of Australian Indigenous Studies at the University of Melbourne. Mr. Nelson Abiti, Curator of Ethnography and History at Uganda National Museum. Mr. Brook Andrew is Chief Investigator of the Australian Research Council (ARC)-funded project ‘Representation, Remembrance and the Memorial’ designed to respond to the repeated high-level calls for a national memorial to Aboriginal loss and the Frontier Wars. He is an interdisciplinary artist and curator whose practice examines dominant narratives, often relating to colonialism and modernist histories. Drawing inspiration from vernacular objects and the archive Brook travels internationally to work with communities and various private and public collections. Image: Launch of commemorative marker, Standing by Tunnerminnerwait and Maulboyheenner, by Brook Andrew and Trent Walter, commissioned by City of Melbourne, 11 September 2016. Photograph by Dianna Snape. 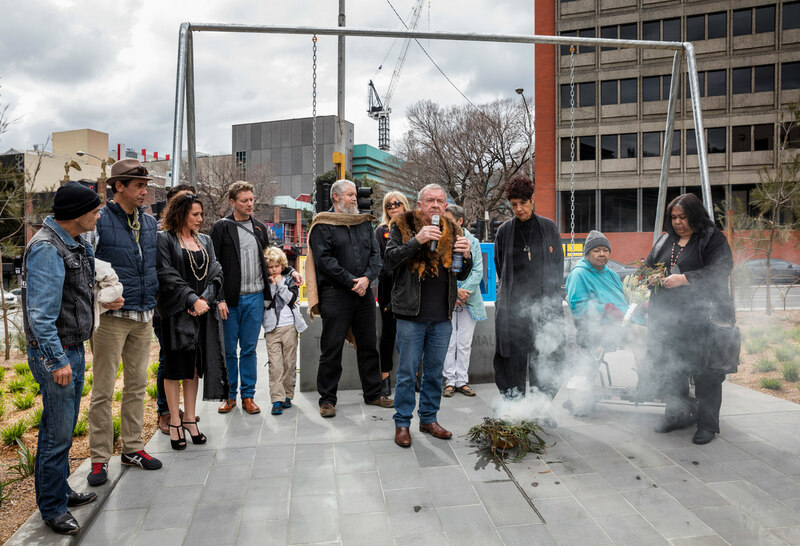 MUMA and the RRM project acknowledge and pay respect to the Traditional Custodians of Melbourne, the Boon Wurrung and Wurrundjeri peoples of the Kulin Nations, on whose lands we gather.